One of the criticisms evolutionists often throw at young-earth creationists when they deal with origins issues is that they are begging the question--that is, that they commit a logical fallacy in which the proposition to be proved is assumed implicitly or explicitly in the premise. For example, when Radioisotopes and the Age of the Earth project researchers reported that helium diffusion rates in zircons, polonium radiohalos in biotite, and radiocarbon in coal argued for a young earth,1 old-earthers accused the RATE group of begging the question that the earth is young. The critics claimed that it was inappropriate to take a position on the age of the earth prior to collecting data in order to prove a position. Yet, one of the standard approaches in science is to state a null hypothesis and then attempt to disprove it. If the null hypothesis can be disproven, then the probability that an alternative hypothesis is true can be established. Another approach is to gather independent sets of data that support or deny a hypothesis. The quantity and quality of evidence can then be used to argue for or against a hypothesis. RATE used both of these approaches. There is nothing wrong with stating a position before conducting scientific research. In fact, the results of a study often have more credibility if the expected results are stated beforehand. It is extremely important, however, to be forthright and clear about stating any hypotheses and being scrupulous in reporting evidence for and against the hypotheses. Another important factor is to be open to evidence developed during the investigation. It is common to discover details about a process that was not completely understood prior to the collection of data or experimental studies. Consequently, the original hypotheses may not have been clearly or sharply stated. It is common practice in statistical studies to conduct exploratory experiments on a limited data set to help sharpen the hypotheses. Then, once the experimental procedure and the hypotheses are finalized, a confirmatory experiment is conducted on a larger, independent set of data. There are many examples in which the logical fallacy of begging the question has caused great embarrassment to scientists and the scientific community. A recent, very public example of such inappropriate behavior and scientific malfeasance is the global warming fiasco. Beginning in the 1950s, some geophysicists became concerned that the release of pollutants into the atmosphere and oceans could lead to environmental changes that were detrimental. Increasing concentrations of carbon dioxide and particulates from factories and automobiles were of special concern because of their potential impacts on solar and terrestrial radiation and the global energy balance. Roger Revelle, one of the founders of the University of California at San Diego, was a well-known and highly respected oceanographer. He briefly taught natural science at Harvard University, where Al Gore took a class from him in the late 1960s. Gore was impressed by the persona of the man and his ideas on global warming. For many years, Revelle taught that industrialization after World War II would introduce large quantities of carbon dioxide and particulates into the atmosphere, primarily from the burning of coal and oil, which would cause an increased greenhouse effect. During the International Geophysical Year in 1957, Revelle acquired funding to establish a research station atop the Mauna Loa volcano on the Big Island of Hawaii to measure carbon dioxide concentration. The measurements were made there to avoid any local contamination from industrial sources. They were intended to represent a well-mixed, global average. 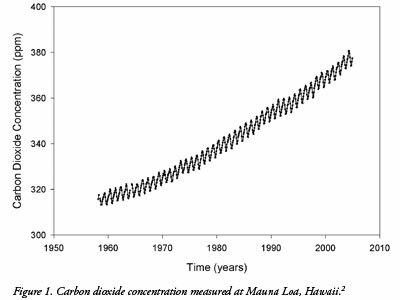 The trend in carbon dioxide concentration shows an increase with time that is a weak parabolic upward relationship. Carbon dioxide concentration in the atmosphere has increased by about 20 percent between 1958 and 2006, from 315 ppm (parts per million) to 380 ppm. There is a strong annual oscillation in the concentration of about 7 ppm, with high values in the northern hemispheric winter and low values in the summer. Based on a relatively simple radiation model of the atmosphere, an increase in carbon dioxide should cause an increase in the greenhouse effect--the trapping of infrared radiation in the atmosphere. An increase in the greenhouse effect would be expected to produce global warming. This is the primary reason begging the question has occurred in global warming. The observation that carbon dioxide concentration has increased since 1958 is almost unquestioned by anyone. And it is fairly straightforward that the introduction of increased carbon dioxide in a simple radiation model should lead to global warming. But the most likely source of error comes from cloud and particulate interactions in the atmosphere. Roger Revelle admitted to the author that cloud effects had not been adequately treated.5 This admission led to the establishment of a new climate observation and modeling group at the University of California in San Diego in the mid-1990s. Probably the most alarming failure of the climate community to follow proper scientific procedures has surfaced in recent emails from scientists associated with the Intergovernmental Panel on Climate Change (IPCC), a worldwide group of scientists and administrators who were charged with evaluating evidence for global warming and making recommendations to international agencies. The emails, which recently became public, revealed that a number of the leading scientists had not only been blackballing scientists who were critics of global warming, but had gone so far as to block publication of their research.7 This fiasco has become known as Climategate, an oblique reference to Watergate, an illegal break-in at the National Democratic Committee Headquarters during the Nixon administration. Some members of the IPCC and other scientific societies and associations became so convinced that man-made global warming is occurring that they closed their eyes to any evidence to the contrary and committed some of the worst forms of scientific fraud imaginable. Begging the question in this case can have far-reaching effects. The economies of nations and the globe can be severely affected, the credibility of science and scientists can be degraded, and, if action is initiated to reverse perceived man-made global warming when it is, in fact, natural variation, precious resources could be squandered. Begging the question is not only a logical fallacy, it has practical consequences. Vardiman, L., A. A. Snelling and E. F Chaffin, eds. Radioisotopes and the Age of the Earth: Results of a Young-Earth Creationist Research Initiative. El Cajon, CA: Institute for Creation Research and Chino Valley, AZ: Creation Research Society. Keeling, R. F., S. C. Piper, A. F. Bollenbacher and J. S. Walker. 2009. Atmospheric CO2 records from sites in the SIO air sampling network. In Trends: A Compendium of Data on Global Change. Carbon Dioxide Information Analysis Center, Oak Ridge National Laboratory, U.S. Department of Energy, Oak Ridge, Tenn.
Gore, A. 2006. An Inconvenient Truth: The Planetary Emergence of Global Warming and What We Can Do About It. Emmaus, PA: Rodale Press. Vardiman, L. 2008. A New Theory of Climate Change. Acts & Facts. 37 (11): 10. Vardiman, L. 1993. Personal communication during a question and answer session following a presentation by Roger Revelle on global warming at San Diego State University, San Diego, CA. Vardiman, L. 2008. Does Carbon Dioxide Drive Global Warming? Acts & Facts. 37 (10): 10. Leaked emails from the Climate Research Unit at University of East Anglia in London, England, December 2009. Posted on neuralnetwriter.cylo42.com. * Dr. Vardiman is Chair of the Department of Astro/Geophysics. Cite this article: Vardiman, L. 2010. Climategate: Begging the Question. Acts & Facts. 39 (5): 12-13.